About 120 people participated in a protest organised by the Tibetan-Flemish Circle of Friends in Brussels on Tuesday 13th March 2014, to express their deep concern over a 2013 change in Belgian asylum law, which has led to Tibetan refugee applications being rejected. This is due to the fact that the law considers asylum seekers who have spent time in a third country before arriving in Belgium, as already having a ‘status’. Almost all Tibetans escaping their country go to India first, to meet their spiritual leader H.H. the Dalai Lama and to be educated in Tibetan and about buddhism, the Tibetan culture and traditions. However, asylum procedures do not exist in India, and since they cannot obtain any official documents, return to India is impossible, and many are forced into illegality. On Tuesday 13th May 2014, the Tibetaanse-Vlaamse Vriendenkring (Tibetan-Flemish Circle of Friends) organized a peaceful silent demonstration for the Tibetan refugees in Belgium in front of the building of the Council for Foreigners Disputes in Brussels. The action was an initiative of the special Working Group “Help for Tibetans in Flanders”. 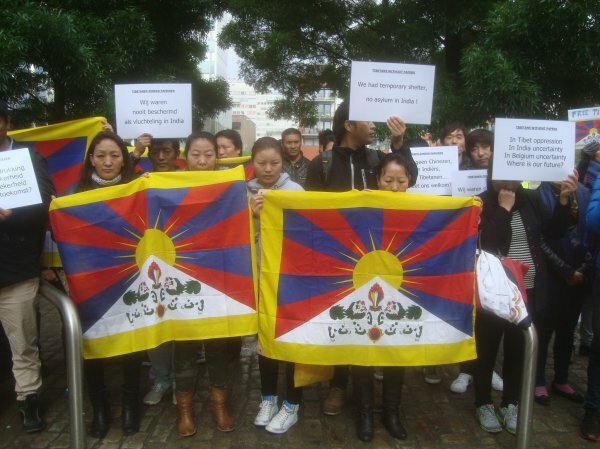 About 118 people in total participated in the manifestation, around 110 Tibetans and 8 Belgian Tibet supporters. The silent demonstration lasted one hour and twenty minutes. Slogans were shown on placards: “India never signed the refugee convention”, “Tibet -> India -> Belgium -> no man’s land?”, “We have never been recognized as refugees”, “In Tibet oppression, in India uncertainty, in Belgium uncertainty, where is our future?”, “We are not Chinese, no Indians, we are Tibetans… who welcomes us?”, “We had temporary shelter, no asylum in India!”, “We have no voice” and so on. This new law has very serious consequences, particularly for refugees of Tibetan origin, more so taking into account that before this law 90% of Tibetan asylum seekers was granted the status of refugee (according to Art. 48/3 Foreigners Act) by the Commissariat-General for Refugees and Stateless. Since the new law, the asylum applications of Tibetan refugees are systematically being rejected, with all consequences. Almost all Tibetans escaping their country go to India first, to meet their spiritual leader H.H. the Dalai Lama and to be educated in Tibetan and about buddhism, the Tibetan culture and traditions, because this is strictly forbidden in China and Tibet. A change in the asylum regulations makes that all those Tibetans no longer get asylum in Belgium because the Commisariat for Refugees considers India as “first country of asylum”. This is strange because India never ratified the United Nations international agreements on asylum, so asylum procedures do not exist in India and refugees therefore cannot get asylum in India. Already a few hundred Tibetans have been denied asylum in Belgium as a consequence of this law. The Commissariat for Refugees urges Tibetans to return to India, and they consider that this can be done easily just by getting the necessary travel documents at the Indian Embassy in Brussels. Some Tibetans have tried to apply for the necessary documents like the IC (Identity Certificate) at the Indian Embassy but didn’t get any and therefore cannot return to India. The result of all this is that a few hundred Tibetans are stranded in a kind of no man’s land now, and that group is growing day by day. A lot of Tibetan refugee cases were handled by the Judges of the Council for Foreigners Disputes in Brussels already. The first judgments have been issued for Tibetans born in India. The Council follows the decisions of the Commissariat for Refugees, namely that those people have to return to India, but the Council has decided so without further investigation into their status in India. We are still waiting for the judgments for Tibetans born in Tibet, but without much hope. On Tuesday 13th May 2014 several cases of Tibetans were handled on the Council for Foreigners Disputes again. On this occasion the Tibetan-Flemish Circle of Friends organized this peaceful silent demonstration in front of the Council to give a signal to the Judges concerning this new law and to express their displeasure and deep concern about this new law in the asylum procedure. With this demonstration we ask the Council to investigate the situation of the Tibetans thoroughly and to seek a solution for their hopeless situation. We find it unacceptable that their asylum is being rejected on the basis that they already got “a status” in India, and that a return to India is impossible. More and more Tibetans are being left without support or care, and will be forced into illegality. If necessary, we are planning more peaceful actions for Tibetans without papers in the future.